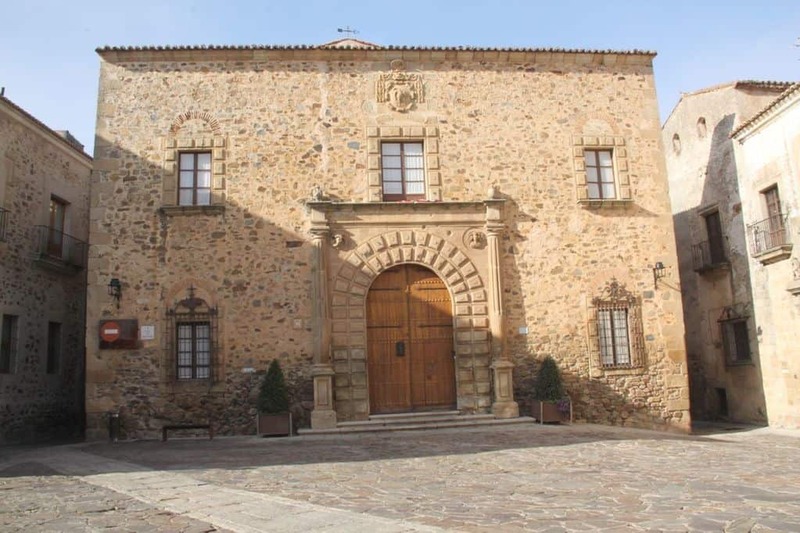 I knew I was going to get a real holiday treat this winter: I was going to Cáceres, a city of Extremadura, one of Spain’s poorest regions per capita. You see, I’d been itching to go somewhere new in Spain, instead of the usual Andalusia (my first love) and Catalonia (my current fling). I wanted to experience something new. And old. I wanted a new old place to visit. Remember, how I said Extremadura is poor? Well let’s flip that fact upside down. 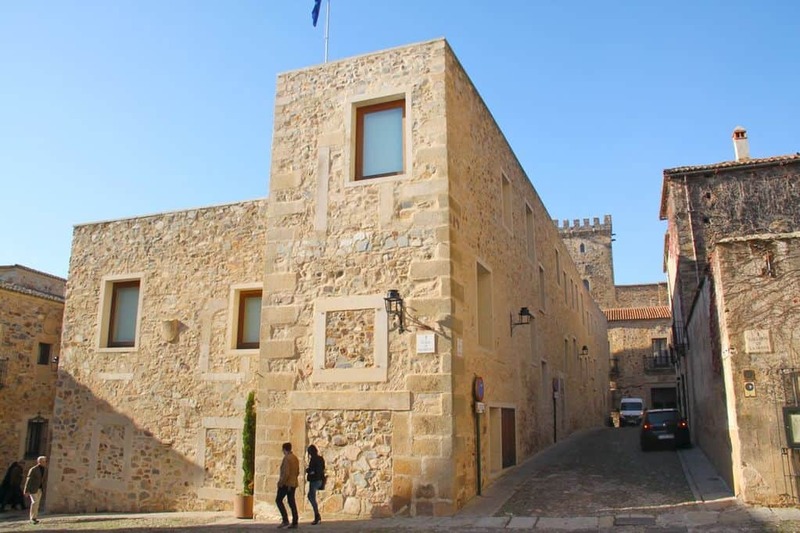 Because what the region’s capital lacks in money, Cáceres is an overflowing wealth in gastronomy, heritage, and pure Spanish culture. 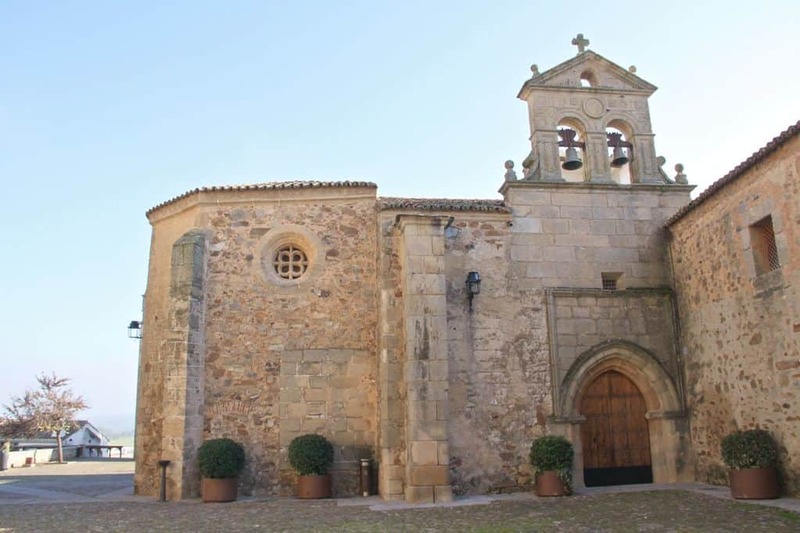 Among its titles are The Gastronomy Capital of Spain 2015 and the UNESCO World Heritage Site, named in 1986. Olé. 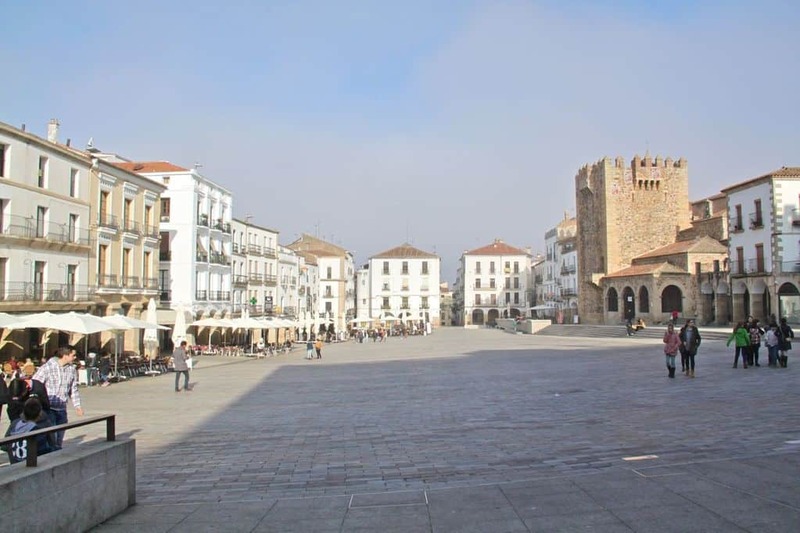 The Plaza Mayor of Cáceres. This is the heart of the city, where you have a chat with friends while having coffee, let your kids kick a ball around, and take in the sun and warmth of humans. I love the concept of Plaza Mayores, and I think every city in the USA should have one. Because, how annoying is it to meet your friends at a frickin’ mall where you’re forced to consume something other than a drink? Below, the Plaza de San Jorge. Walk up the steps, and you’ll find the white-towered Iglesia de San Francisco Javier, a Baroque-style church built in the 18th century. 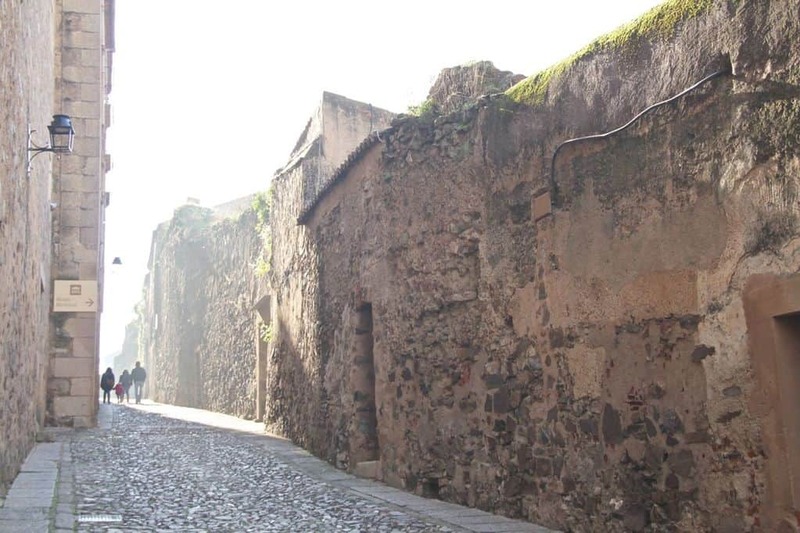 The Romans, the Arabs, Jewish, and Christian people have used and abused this town like no other. Centuries of war and battles in its tumultuous past is reflected in its mixed-style architecture: Rennaissance, Roman, Islamic, and Northern Gothic. 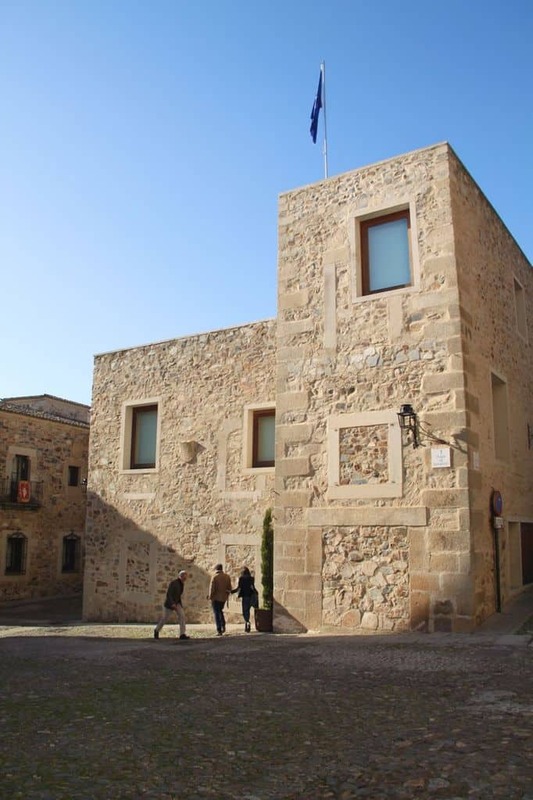 Below is the Palacio Episcopal, a renaissance-style building built between the 13th and 18th century. So enchanting and medieval is the old town that several movies where filmed here like 1492: Conquest of Paradise directed by Ridley Scott. And Treasure Island by Orson Welles. If this were Hollywood, they’d have to build their own damn movie sets. Uh-uh, not here. On a particularly sunny afternoon in the winter, it’s quiet and calm. I just let my mind wander. 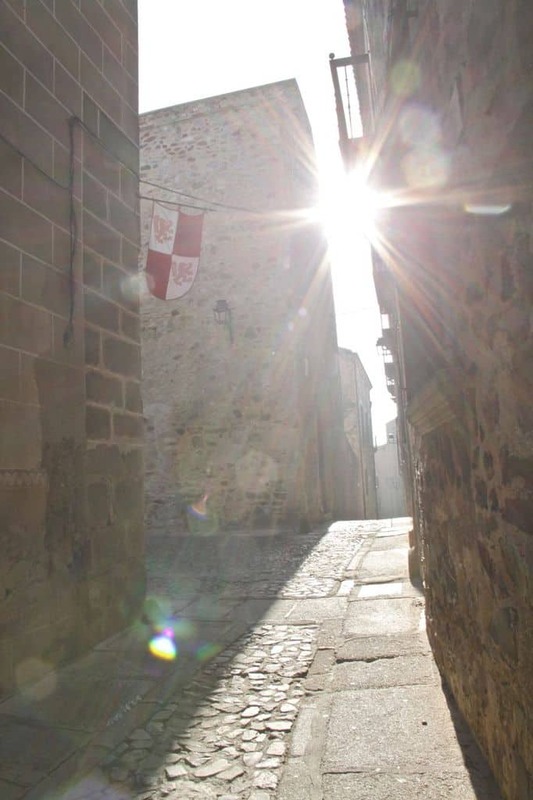 And I dream of knights in armors, and I wonder how women with spiked heels try to walk these tricky cobblestone streets. Right? The Convento de San Pablo in the San Mateo Plaza. 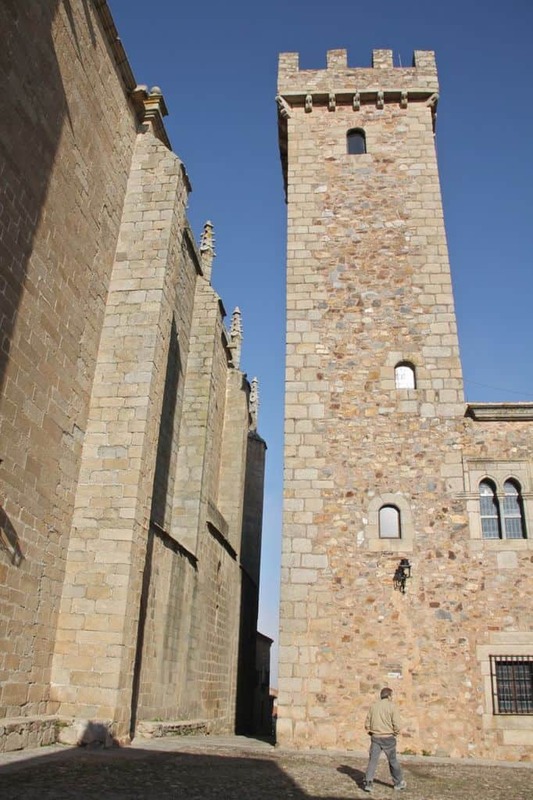 It was built in the 15th century and has a Gothic arc. There are still nuns living here. 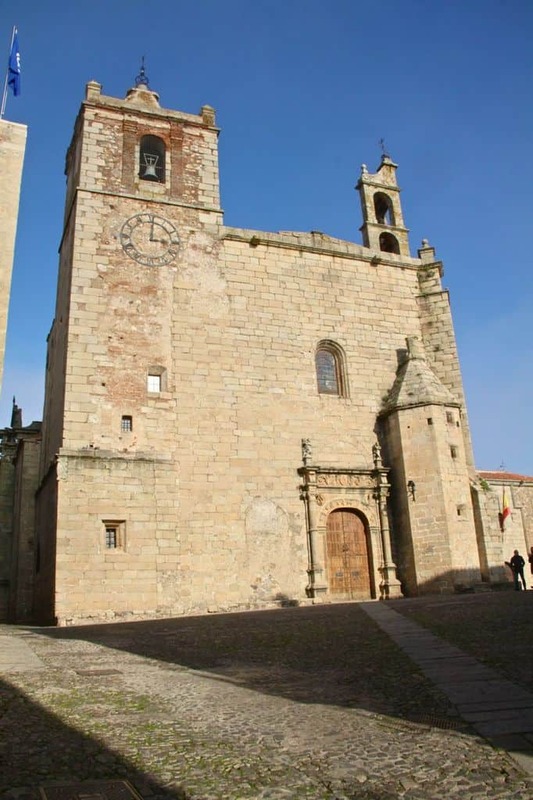 The Iglesia de San Mateo, built in the 16th century, and took 300 years to build. It’s believed that’s it’s built on top of a mosque. Layers and layers of history here, folks. 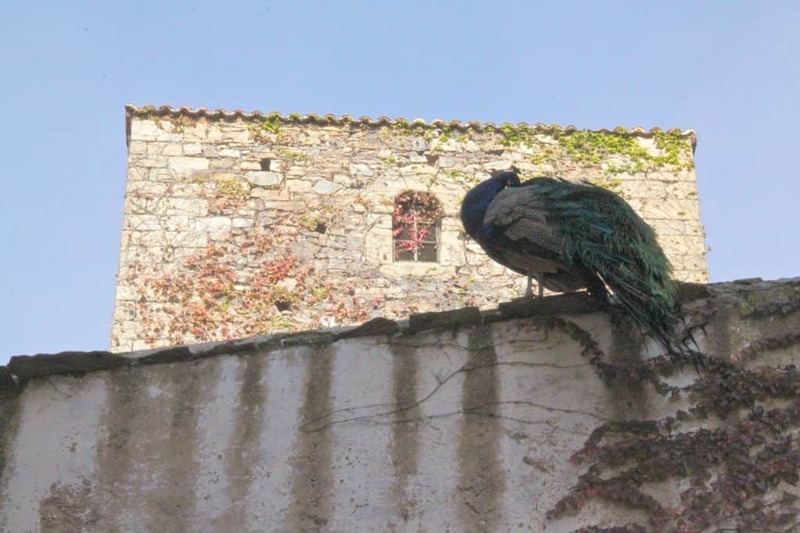 I found a peacock just hanging out on the roof of a building. See. Enchanting, right? 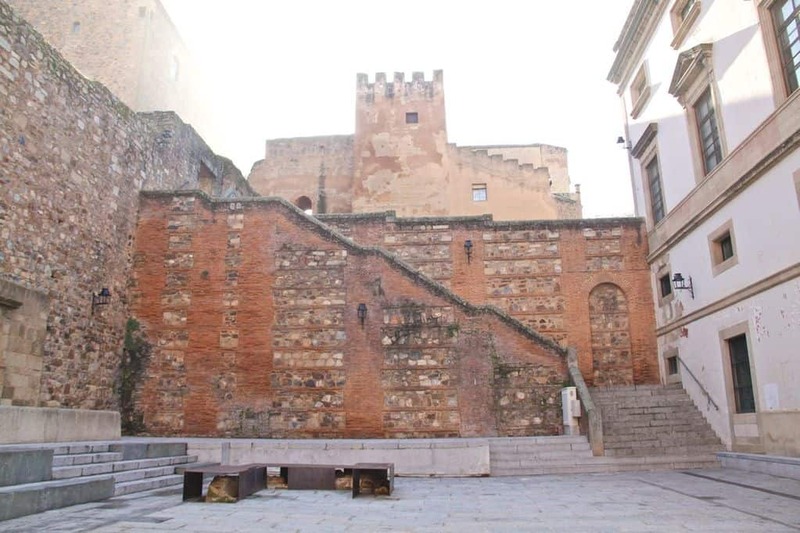 The wall of Cáceres are half-Roman and half-Moorish. They were originally built by the Romans until the Moors took over. It’s amazingly pretty much intact. 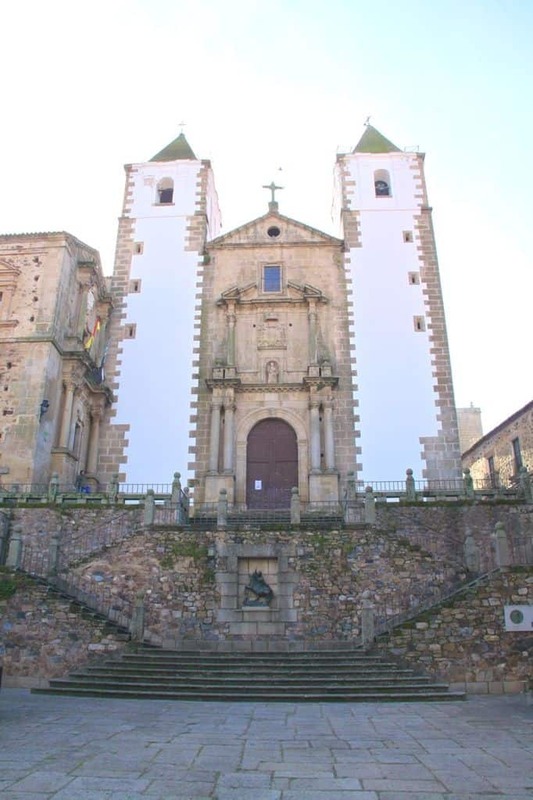 Have you been to Cáceres before? Is this a place you’d love to see? Corrected, Sue! I was lucky to see Mérida too 😛 Thanks for stopping by! No way, Sue! And here I was thinking you were just good with Spain’s geography! Next time! I am going to Barcelona with my current boyfriend(since Feb this year), this is going to be our first time traveling on a plane together! 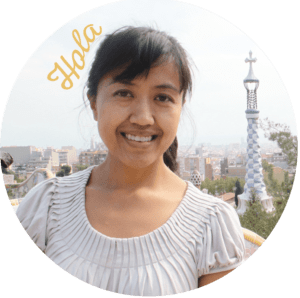 I am excited and nervous at the same time because I am on a budget and we can’t speak Spanish! My question for you is, I will be in Barcelona for 5 days and a day in Ibiza(?). I want to explore one more city. 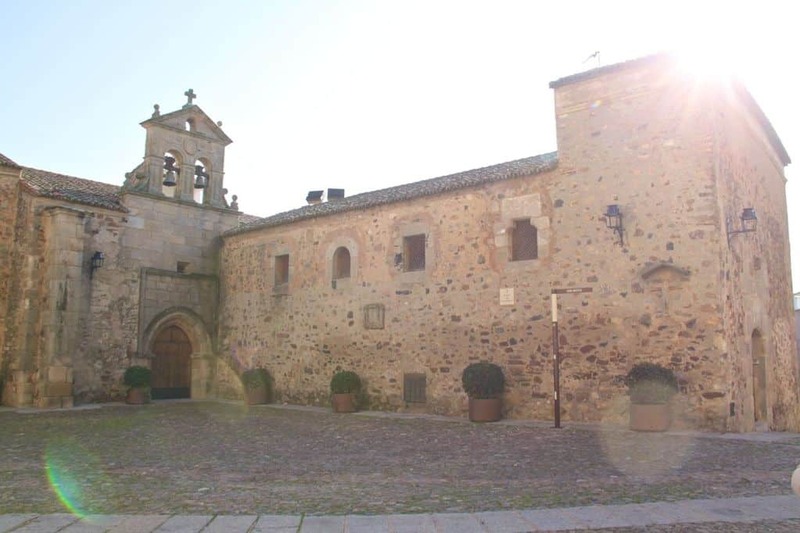 Would you recommend going to Caceres and if so, is it reachable by public transport? Thank you so much! I just came across your blog today and it is awesome! Thanks for stopping by! Cáceres is actually quite far from Barcelona. If you take the train (AVE), I think it’s going to be over 8 hours. Why not Madrid instead? It’s still a long 8-hour trip, but it might be more interesting. You also have Valencia to the south, which I think is 4 hours? If you stay in Catalunya, Sitges is about an hour by train. Cadaques is AMAZING too..although you’d have to take a private bus. I wouldn’t worry about the Spanish language – if you just try, it’s VERY much appreciated. If not, just ask someone “Do you speak English?” first before you start talking to them in English. Most people know at least a little, especially those in the transportation/tourist industry. OK..GOOD LUCK!